25 June 2008, at 9:21a.m. UK - Bristol University's Animal Behaviour and Welfare Group has been awarded £850,000 to find ways to reduce feather pecking and in free-range layers. 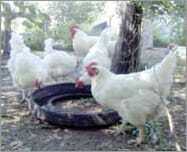 Laying hens often severely peck other hens' feathers, skin or vents. This not only causes pain but can also lead to cannibalism and death. Harmful pecking is a serious animal welfare concern and can cause great economic losses for the farmer and the egg-production industry as a whole. Researchers Dr Chris Sherwin, Professor Christine Nicol and Dr David Main at the University of Bristol's Animal Behaviour and Welfare Group have been awarded over £850,000 over three years by the Tubney Charitable Trust to reduce harmful pecking by using existing knowledge to improve the welfare of free-range laying hens. There is already considerable scientific and industry-based information on harmful pecking but it has never been pulled together as a single resource for the egg production industry. Using scientific information, expert opinion, detailed advice from the industry, and taking financial implications into consideration, the researchers hope to develop a practical, cost-effective husbandry advisory pack with the aim of preventing harmful pecking amongst free-range laying hens. "Harmful pecking is both a serious welfare concern and an issue of great economic significance." The advisory pack will make the information accessible to egg farmers and their advisors, and will identify the most appropriate husbandry solution for each individual farm. The researchers will develop the pack to enable individual farms to recognise and reduce risk factors of harmful pecking, recognise and distinguish between different forms of harmful pecking, and promote the farmer's ability to reduce pecking by following recommendations. The intervention strategies contained in the pack will be evaluated on numerous recruited farms, and feedback from farmers and field-assistants will be used to develop the usefulness of the pack over a three-year period. Flagship farms around the country will be signed-up as demonstration units allowing visits by other farmers, retailers, scientists and policy makers to observe the advisory pack 'in action'. Dr Chris Sherwin, Senior Research Fellow in Animal Behaviour and Welfare, Farm Animal Science at Bristol University, said, "Harmful pecking causes stress, injuries, increased vulnerability to disease, and when feathers are removed by pecking, the pecked hens compensate for the reduced insulation by eating more food. When harmful pecking causes death, this obviously leads to an immediate end of egg production. Harmful pecking is therefore both a serious animal welfare concern and an issue of great economic significance." Work on the advisory packs will proceed in three phases. Initially, the researchers will conduct a review of current literature and other information to translate this into a workable advisory pack. The researchers will then implement the package on a range of farms, monitor its effectiveness and feed back into the package information collected during numerous farm visits and farmer reports. A third phase, which is not funded, will be an industry-wide roll-out of the advisory pack with the most effective strategies promoted to the industry. There are 30 million laying hens in the UK flock and an extensive survey conducted previously by the Behaviour and Welfare Research Group has revealed that 55 per cent of flocks are affected by harmful pecking. This indicates that each year, several million hens are suffering from this welfare problem. The motivation to reduce harmful pecking and improve the welfare of laying hens is great, originating from consumers, farmers, retailers, welfare organisations, assurance schemes, scientists and legislators alike. Although there might be different reasons underlying this motivation, all these stakeholders wish to see a decrease in harmful pecking.